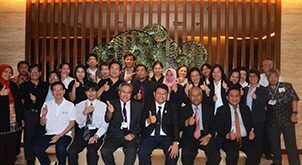 SEAFDEC organized the Departments Chiefs’ Meeting in Langkawi, Malaysia on 10 November 2018. 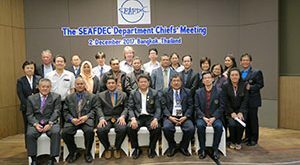 The Meeting was attended by the SEAFDEC Secretary-General, Deputy Secretary-General, the Chiefs of SEAFDEC Departments and Senior Officials from SEAFDEC Secretariat and Departments. The follow-up actions from the 50th Meeting of SEAFDEC Council, 41PCM, and 21FCG/ASSP as well as the Way Forward of 2011 Resolution and Plan of Actions based on the timeline of revision of Resolution and Plan of Actions were discussed during the Meeting. Moreover, the Meeting agreed on the implementation of the SEAFDEC Gender Strategy in the operations of respective Departments upon the approval of the SEAFDEC Council. Information-related matters were also discussed, especially the Notes for Writing and Editing SEAFDEC Documents and the SEAFDEC Standard for Official Documents and Stationeries which have been developed by the Secretariat and Departments. The Meeting took note of enhancing the capacity of SEAFDEC staff through various channels such as training courses and fellowship programs.